The judge in Oscar Pistorius' murder trial has ordered the South African Paralympic athlete to undergo a mental health evaluation. This follows a request for psychiatric analysis by the prosecution. The details of the evaluation will be revealed next week. Oscar Pistorius sits in the dock in court in Pretoria, South Africa, Wednesday, May 14, 2014, as the judge overseeing his murder trial ordered him to undergo psychiatric tests, meaning that the trial proceedings will be delayed. The court adjourned until May 21, 2014. A grim faced Oscar Pistorius arrived at the court - no doubt aware that his murder trial was likely to take a further twist. The prosecution had argued that Pistorius should undergo a thorough mental evaluation after a defence witness claimed the athlete was suffering from general anxiety disorder.In order to ensure a fair trial, it left Judge Masipa no option but to grant the order. "It is necessary to emphasise that an application of this nature is never taken lightly, as it is an integral part of a fair trial. Having regard to the above, I am satisfied that a case has been made out for the application or the relief, as sought by the state, and I shall grant that order." Thokozile Masipa said. Afterwards, the athlete was flooded by the media. He will return to court on Tuesday when the conditions of the ruling will be revealed. He'll find out where the testing will take place whether he will be an inpatient or an outpatient - as requested by the judge as well as the length of the observation, which is likely to be 30 days. His family remain upbeat about the ruling. "As a family we are comforted by the thoroughness and detail of this judgement. And Judge Masipa's commitment using every avenue to ensure a fair trial. It is about a fair trial." Uncle Of Oscar Pistorius Arnold Pistorius said. The defence had opposed the order with senior counsel Barry Roux claiming such action was premature. South African Legal experts believe the decision was a victory for the prosecution. "Obviously the only person who benefited from this today was maybe the prosecution in the sense that they had a win up their sleeves. Not that it is a win win for anybody. However, I don't think the defence wanted Oscar Pistorius to end up in a mental institution pending the finalization of the trial." President Of Law Society Llewellyn Curlewis said. Dr Merryll Vorster claimed Pistorius was suffering from General Anxiety Disorder… She claimed it could have played a role during the incident last year when the Olympian shot and killed Reeva Steenkamp. And Pistorius can expect an arduous time as he undergoes the evaluation. "I think it is going to be an enormously tough process. I think it has upped the stakes a lot. What that would entail is evaluation by Psychiatrists. Probably Psychometric testing by Psychologists. But now what is going to happen, probably is that new evidence is going to be introduced and it could be potentially even more damaging for him." Psychologist Leonard Carr said. 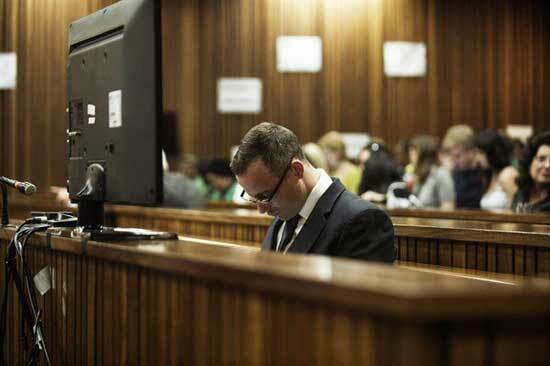 So another dramatic twist to this Oscar Pistorius murder trial. On Tuesday, we should learn further details as to the nature of this Psychiatric Testing. And then this whole process will be put on hold for at least 30 days - a further delay to an already lengthy trial. The judge in Oscar Pistorius' murder trial has ordered the South African Paralympic athlete to undergo a mental health evaluation.